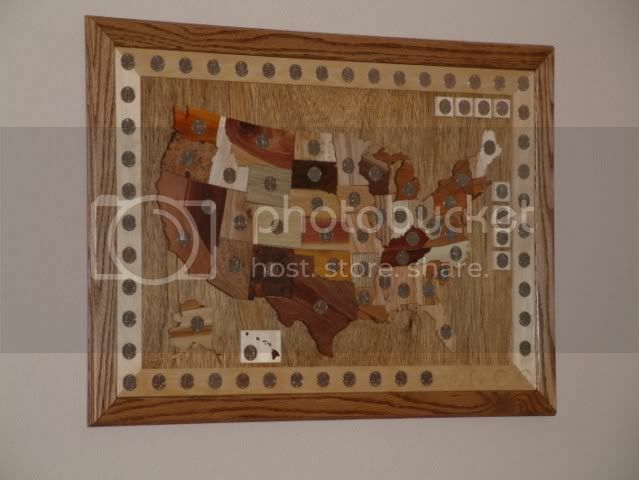 Thank you so very much to everyone that helped with the state quarter map... in case some of you don't know, this was to be a christmas gift to LOML (a couple of years ago) and is made up with woods that actually came from the state from which it was cut out. I still need to gather my info with everyone's stories and names to go in the book that will (eventually) go with the map, but needless to say I couldn't have done it without all of you. Your generosity and eagerness to help have truly made this a labor of love. AWESOME Lawrence, Glad to be part of it! Lawrence it looks great---and in time for Christmas???? She didn't say what year she wanted one did she?? Seriously, it looks really nice. What quarters is she looking for? Post them and just might get them faster. Looks great Lawrence. Glad to have helped out. You have to publish the book here. That should make some great reading. Great project, great execution, great result. As all the others, I'm glad to be a part of it! Great job Lawrence!! Wow, that is a lot of dedication. It took a long time. BEAUTIFUL JOB!!! I really like that and you and your wife should be very proud to display that for others to enjoy! That is real art and, a keepsake for years to come. If I rember right, you were "out of country" during some of that time weren't you? Great job,glad to have made a contribution. wow thats gorgeous! An awesome project and nice to see it finally finished! I am also glad to have been able to contribute to such a great piece of art. All the different woods really sets it off and by no means was that an easy task. Congratulations. Very cool. Glad to see it come to fruition. Good job, Lawrence. I like the way you've made the grain go different directions--good way to help distinguish between the different states. Well I guess you always seen the light at the end of the tunnel this is what the other end looks like. Great job it really payed off. LOML has fun collecting the quarters, but thanks for the offer anyway Bob. The final project differs from the plans in that LOML decided she did not want the glass/acrylic over the front, she likes to feel the pieces. Lawrence, thats a cool looking map. Great job Lawrence. Looks fantastic. Great patience and perseverance.